Single Slide, Rear Bunk Beds, Booth Dinette,Large Shower, Sink, Toilet, Refrigerator, 3 Burner Range, Double Kitchen Sink, Slide Out Booth Dinette/Sofa, Flat Screen TV, Queen Bed, and More. This price includes the seasonal fees for 2019. ​Description: 2015 Northlander Reflection 2 bedroom sleeps 10 for sale. Professionally built and installed by H & H Patios 27' x 10' deck and a 28' x 11' hard awning. · Heating/AC. with fireplace. Two 30lb propane tanks. Sixteen gallon water heater. Dual day/night shades on all windows. · Master Bedroom queen bed, full mirrored closet, night stands, and storage cupboards. · Second Bedroom has one double and table with seating that converts to a second double as well as two twin bunks. · Central air, furnace, 6 gallon hot water tank, full size gas stove, range microwave, full size fridge, electric fire place. · Pull out couch, accent chair, coffee and end tables. · Round dining table with 4 chairs. · Bathroom with tub/shower, bath and vanity. · 27' x 10' deck on 6' x 8' beams with railing, two stairways, and a 28' x 11' hard awning, new 10' x 8' pine shed with a steel roof. · ​Heating/AC. with fireplace. Two 30lb propane tanks. Sixteen gallon water heater. Dual day/night shades on all windows. · Bathroom has full-size bath/shower combination. Above and below sink storage. · Kitchen /dining area GE fridge, propane stove and microwave. · Many cupboards and dining room table and chairs included. Table Leaf extends up to 6 people. 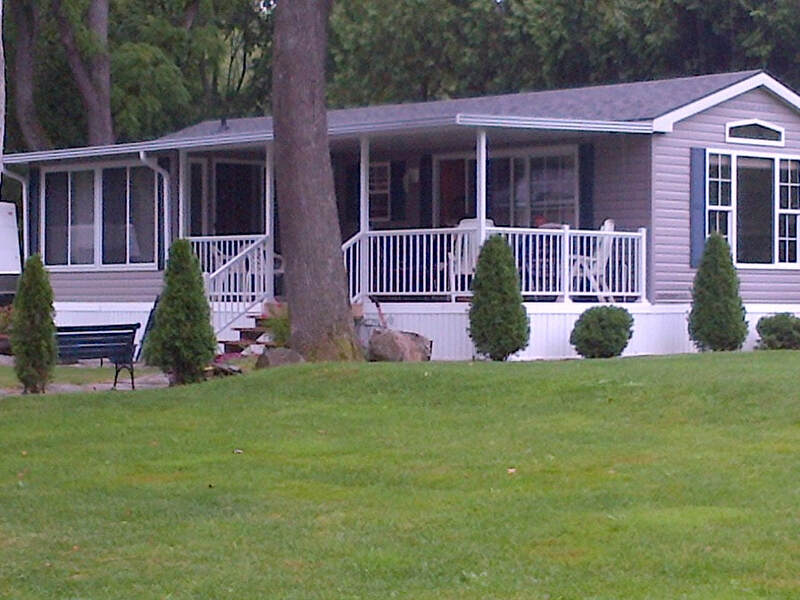 ​Description: 2014 Northlander Cottager Escape 2 bedroom for sale. 39' x 14' with a 10' x 31' deck with a hard roof. Includes 10' x 14' sun-room/ extra bedroom. Professionally built and installed by H & H Patios. White vinyl skirting. · ​Heating/AC. 26 inch electric fireplace. Two 30lb propane tanks. Sixteen gallon water heater. Dual day/night shades on all windows. · Bedroom 1 8' x 9'.4" Queen size bed, large walk in closet with dresser and all round rail system. Storage cupboards above bed. Two night side tables with lamps. · Bedroom 2 6'6" x 7'8" Double bunk below, single bunk above. Storage drawers under lower bunk. 4 drawer dresser. Lamp. · Bathroom has sun tunnel, full-size bath/shower combination. Above and below sink storage. · Kitchen /dining area 7'6" x 13'3" Full size fridge, propane stove and microwave. Many cupboards. Dining room table and chairs. Leaf extends to seat six people. · Living room 11'4" X 13'3" Sofa bed (used once), swivel chair, coffee and two end tables, lamps, 32" smart TV with Blue Ray theater system. · Wired for cable TV. · The sun room has a double sofa bed and there are blinds on all windows for privacy if using as a bedroom. · The covered deck has two swivel chairs, a two seater sofa, coffee table and end table as well as a wood bistro set. · Included is an approx. 4'x6' vinyl storage shed with shelves. New in 2015. · There is a large vinyl deck box at the side of the unit to keep firewood etc. in.